There are a thousand ways to build a mega structure. The mathlings in Zapzapmath are great experts at adding up the levels and making something amazingly zaptastic. Which is why they want you to join the team in one of our subtraction games. After noticing the many math skills that you have accumulated since you first began your journey into the ecosystem, the construction team is eager to get you started on their latest development: a tower that can be seen from anywhere in space! Building a mega structure is a difficult job, but the team believes that you would make a great addition to the team. In order to assist on the production of this tallest of towers, you are assigned to the task of preparing the right amount of construction sand piles to be used. The weight of these piles could go up to hundreds, so be prepared for some heavy math lifting! To get things started, study the top panel for the total amount of sand required. There are piles of sand already prepared for your picking, but there is a problem: you do not know which piles will add up to the total amount needed for the job. Each pile of sand has numbers indicated on them. These numbers vary between 1000’s and below, and may range from smaller amounts to much bigger amounts. To get the total amount, try various combinations of subtracting the required number by each pile. 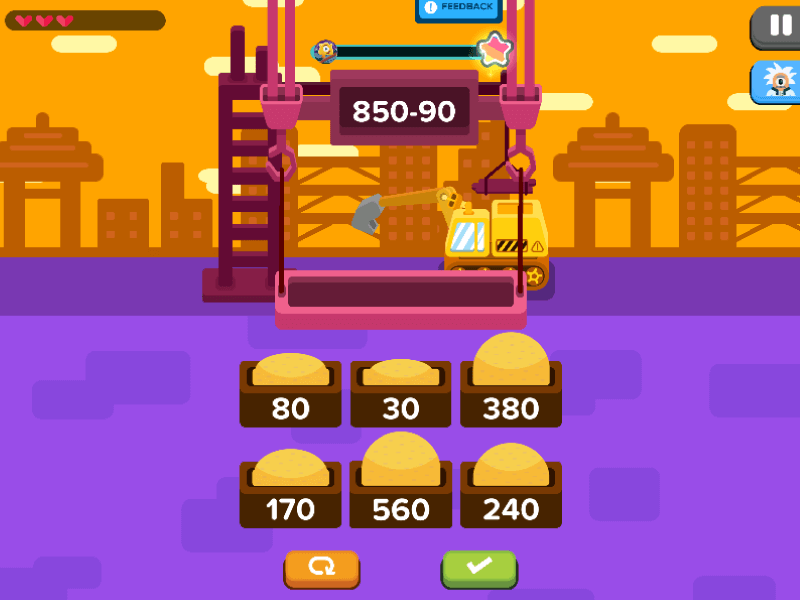 When you believe you have the right combination of numbers to make up the total amount needed, tap on them to place them onto the crane platform and click on the green button to submit. If your calculations are correct, the crane will lift the platform up. If you make a mistake, the crane will break and fall. Do not be afraid to make mistakes; this game relies on using different strategies of adding and subtracting to get the method you're best at. Mega Builder is a comprehensive addition and subtraction game that builds on strategizing solutions to problems. It teaches you to get comfortable with adding substantial amounts up to make even bigger amounts of up to a thousand, or subtracting large amounts to find the right combinations for up to a thousand. As you progress through each level, more numbers are introduced into the process. Approach each exercise like an intriguing math mystery waiting to be solved. Experiment with different approaches and combinations to better understand the results that you are trying to achieve. Consistent practice will allow you to gain a better thought process. Training is beneficial for the mind to simplify the manner in which you understand the problem and how to obtain the ideal solution. Keep exploring various combinations to eliminate possibilities in the option piles, and soon, you will be mastering additions and subtractions by thousands. Add your way up to such great heights!